Now Open in Glastonbury! 1420 Main St. Suite 114, Glastonbury, CT. Hours: Mon, Tues & Friday 3-6pm and Saturday mornings. When you first step inside Damato Chiropractic Center (DCC), you’ll be made to feel like you’re part of our family. After all, we are a family-friendly complete wellness center. 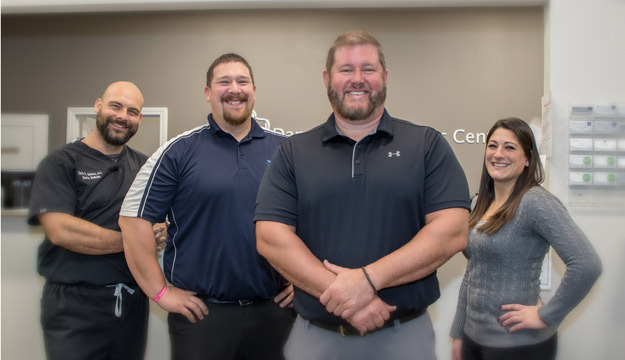 Our Newington chiropractors, Dr. Eric Damato, Dr. Stephanie Kahler, Dr. Wade Federspiel and Dr. Chris Giannos are passionate about providing safe and effective chiropractic care to help you perform better and function better. benefit from care. We are pleased that our patients agree by spreading the good news to family and friends. hours old and the oldest is 96 years old. At Damato Chiropractic Center, we want to help you take your first step toward better health and wellness. Our programs are designed to correct injuries and maintain the correction long enough for the body to heal. Massage Therapy, Athletics and Rehabilitation, Health and Wellness Guidance and Life Coaching. Take that first step toward optimal health! Give our office a call today to schedule an appointment.